These spicy and rich Wrapped Bacon Jalapeño Poppers are quite possibly the world’s greatest appetizer and are a popular favorite at any type of party. 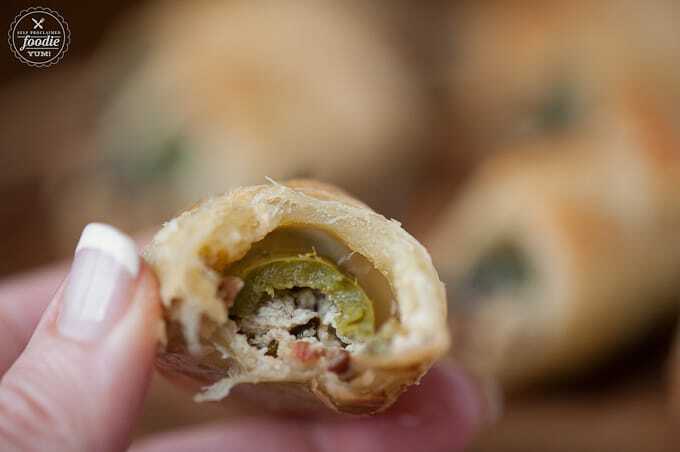 I honestly wish I had the power to allow you to reach into your screen and grab one of these poppers, filled with crisp bacon, spicy jalapeno pieces, rich cheeses and wrapped up with decadent puff pastry dough. Words simply can’t describe how insanely delicious these bad boys are. Just know that once you eat one, you won’t be able to stop. I know this from personal experience. 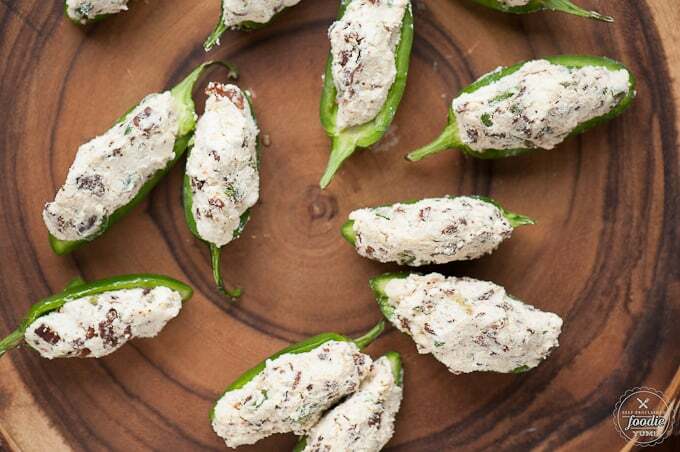 Like all good jalapeno poppers, this recipe starts with halved jalapenos. I chose to remove the seeds and veins but I used my not-usually-impressive knife skills to slice that stem right in half. No particular reason other than I liked the way it looked. 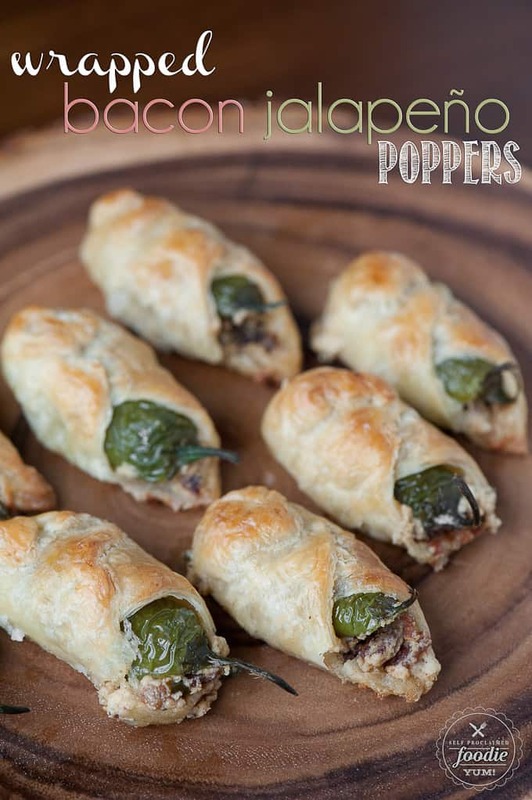 I had actually never made jalapeno poppers before and I am proud to say that I totally winged it and made this recipe up from scratch. My greatest creations usually start that way. I love BACON. As much, if not more so, than the next person. 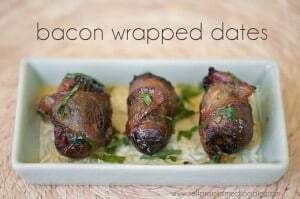 But one of my pet peeves and self proclaimed foodie annoyances is bacon that is not cooked properly. To me, bacon served on its own should be chewy. But if you mix that bacon in with anything that could possibly rehydrate it, you better cook it well enough that it doesn’t start to look raw again. With bite sized little treats like these, I also very much like having bacon pieces versus strips of bacon because they’re easier to bite… and I’d rather only have people think I’m a huge pig based on the number of poppers they see me shove into my face rather than that combined with a long strip of bacon hanging from my mouth because I couldn’t bite it off. You know what I’m talking about. I also decided to mix little pieces of cooked jalapeno with their seed in with the cheese because I wanted that extra spice to sneak up on you. It hurts so good. Sure you can spoon the cheese in but I just squeezed up little balls with my hands. It was much easier (and fun). Wrap those little guys up and away you go! 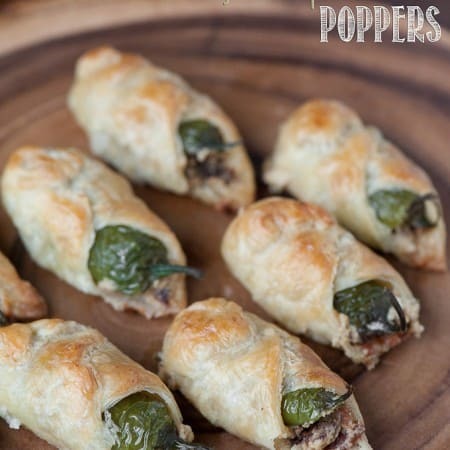 I was a little surprised that some of the cheese and jalapeno started moving out of the puff pastry wrap during the cooking process but no worries there – as soon as I took them out of the oven I just slid them back in. Easy peasy. What you end up with are gorgeous, rich, spicy, flavorful two-bite pieces of heaven. Buttery flaky puff pastry, spicy jalapeno, salty bacon, rich cheese… seriously, what more could you ask for? These spicy and rich Wrapped Bacon Jalapeño Poppers are quite possibly the world's greatest appetizer and are a popular favorite at any type of party. 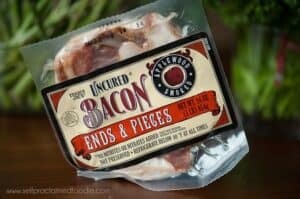 Dice bacon into small pieces and cook according to directions in the bacon ends and pieces post. 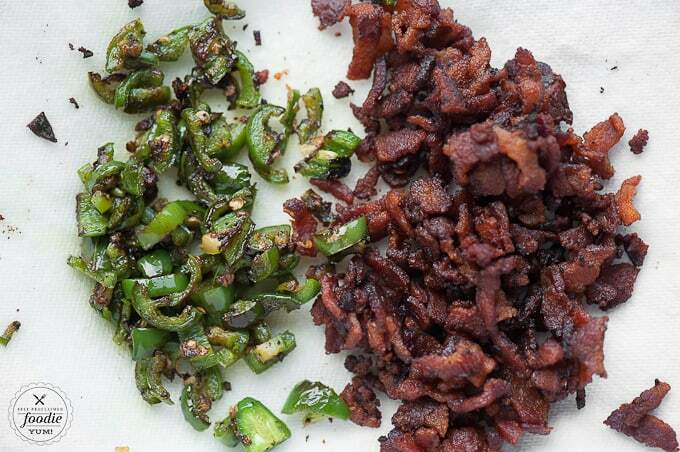 When done cooking, remove cooked bacon pieces and drain on a paper towel. Discard all but 2 tablespoons of the bacon grease. 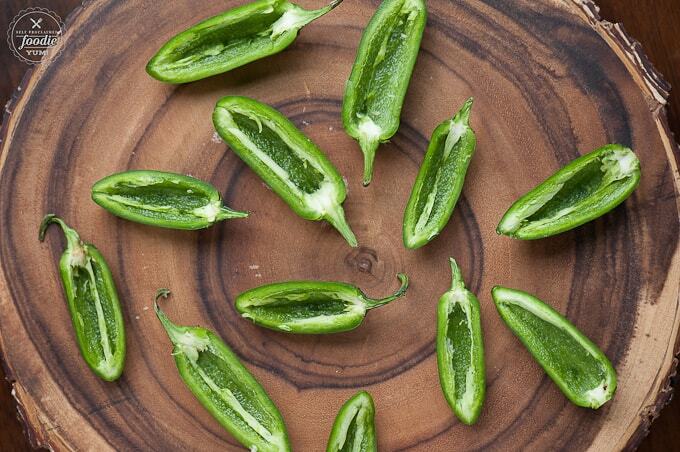 On medium high heat, cook diced jalapenos for about 5 minutes. Transfer to paper towel to drain. 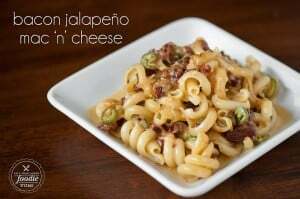 In medium sized bowl, combine cooked bacon and jalapeno with boursin and sharp cheeses. Unfold pastry sheet and cut into 3 columns and 4 rows to make 12 rectangles. 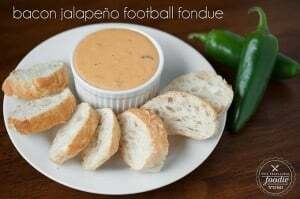 Scoop cheese mixture into jalapeno halves until evenly distributed, about 2 teaspoons each. 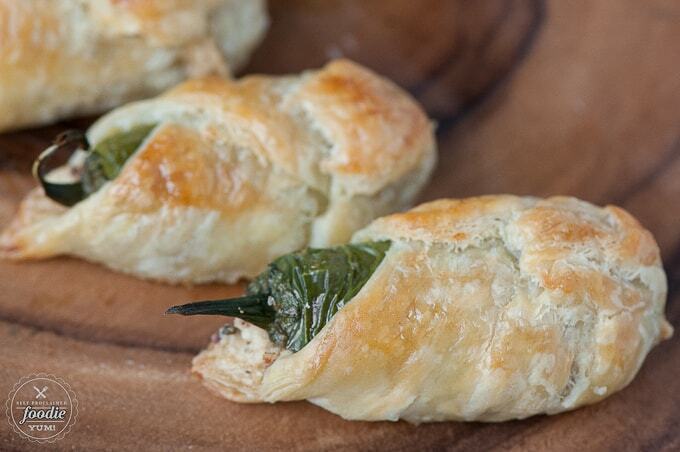 Then place stuffed jalapeno half face down on puff pastry so that the ends are pointing to opposite corners. 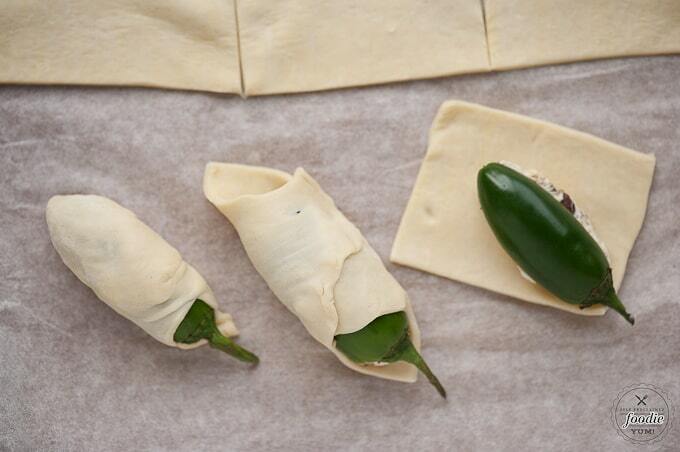 Take wings of dough and wrap around jalapeno and then wrap bottom of dough, press firmly to seal. The end goal is to have the popper wrapped except for the stem portion. If making ahead, refrigerate poppers until ready to cook. Brush the tops of the filled pastries with the egg white (optional). Evenly space the poppers on a baking sheet and bake in preheated oven until golden brown, 20-22 minutes. Remove from oven and allow to cool on baking sheet for 10 minutes. Serve warm. these are awesome!! love anything with puff pastry!! can you put these on the grill?